Right up front, you should be aware that the Contour Design Perfit Mouse has been my main pointing device for a number of happy years. No one knows better than me, however, that what is golden for one individual may be garbage for another. Consequently, I have made an effort to balance the many reasons why I like the Contour mouse against its potential drawbacks. As with everything, your mileage may vary. The Perfit mouse was developed back in the 1990’s by Contour Design of New Hampshire. Employed in their test cycle were the ultimate experts: Computer users who were suffering from RSI. The Contour engineers kept testing until they came up with a device that would allow these unfortunate folks to work an eight-hour day at their oh-so-stressful jobs without undue ill effects. The end result of Contour’s research was a mouse so large it almost seems wrong to keep calling it a “mouse.” Much of the stress we experience when mousing, it seems – the kind of stress that can contribute to Carpal Tunnel Syndrome and other badness – is caused by the force of gripping one of those tiny little mice that comes with a typical computer. Contour’s solution? Make a mouse so large that the user doesn’t have to grip it at all; instead, the hand rests comfortably and effortlessly on top of the mouse. This design also lifts up the vulnerable underside of the wrist from its cold, hard parking place on the desktop. The size and design of the Perfit mouse virtually forces the user to keep his wrist more or less straight when mousing, controlling the mouse from his elbow instead of manipulating it with the tiny wrist flicks typical of standard mice. This is one of the hardest things for new users of the Perfit mouse to get used to, but it is also one of the device’s greatest ergonomic benefits. Tiny motions of the wrist are convenient for precise and effortless mouse pointing, but they are also a main ingredient in the recipe for RSI. By keeping the wrist straight, the Contour Mouse takes away some mechanical control, but so little, in my opinion, that only Photoshoppers who often work at the pixel level would notice. In my case, I have to use a Wacom graphics tablet for certain pixel-perfect work. For all other tasks, including the vast majority of my design work, I use my Perfit mouse. I found that it helps greatly to turn the pointer speed down in the Windows control panel when you’re first learning. As you gain facility with the mouse, this speed will start to “feel” slow and you can turn it up gradually. It’s not immediately obvious, but the Contour mouse avoids the dangerous palm-down twist common to completely flat designs. Your hand isn’t positioned vertically like it is with some mice; instead, it sits at a happy medium of 17 degrees, or about the same as a regular ergonomic keyboard’s “tent” factor. The Perfit mouse is all about eliminating small motions performed by small, weak parts of the body, and replacing them with big motions that can be handled by our beefier groups of muscles and tendons. 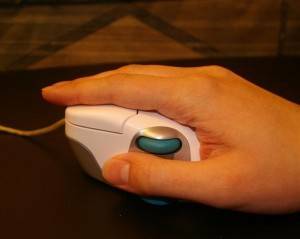 To click a normal mouse, you curl the end of your finger. This action seems insignificant when performed once, but when it is repeated hundreds or thousands of times a day, it can have a wearing effect on the entire hand. To relieve this problem, the Contour Mouse offers something better even than a hair-trigger switch (which would probably increase tension since you would have to hold your fingers stiff to avoid accidental clicks). The buttons of a Perfit Mouse are actuated with an entirely different set of muscles – the strong muscles of the knuckles. The way this works out practically is that you can keep your fingers 90% relaxed at all times, yet click with only the most minute, effortless motion. Clicking a Contour mouse, in my experience, is not much more difficult than forming the thought to do so. I love center-click. Before the Perfit Mouse I was hardly conscious that it existed, but having formed the habit, it would be very hard for me to go back to a two-button mouse. I know, standard mice usually do have a feeble sort of center-click in the form of a “clickable” scroll wheel, but this often so stiff that you have to practically climb your desk and dance on the mouse to make it happen – or so mushy that it’s hard to tell whether or not your click registered. With the Perfit Mouse, opening and closing Firefox tabs and other useful tasks are only an effortless Contour click away; the center button occupies a space of equal size and honor to its left and right-click cousins. In addition to the three main buttons, the mouse has a two-position rocker switch that’s operated with the thumb (useful for Back and Forward in your web browser) and a scroll wheel. Unlike the scroll wheel on a standard mouse, the Contour’s wheel is also operated with the thumb. One size of shoe doesn’t fit every foot, so why should we expect one size of mouse to fit every hand? This was the reasoning behind Contour Design’s choice to make the Perfit Mouse available in multiple sizes – four for the right hand and three for the left. I take a right-hand, large, which is probably the most common size; however, for people with unusually beefy or unusually tiny hands, the availability of extra-large and extra-small could be vital. You will not, to my knowledge, find this in the Contour literature, but some time ago I learned a very important lesson regarding this mouse. It may only apply to me, but I’m going to share it here in case it helps someone else. I bought my first Perfit Mouse in my last job as a graphic designer, where I used it on a smooth-top desk without the benefit of a mouse pad. This wasn’t a particularly scientific choice; it just felt right. When I changed jobs, two things happened: I switched to a more heavily used Contour mouse, and my desk got a pasteboard/paper top. Now, nothing against pasteboard desks personally, but compared to a really smooth composite top, they’re as rough as sandpaper. Consequently, I was for the first time obliged to use a mouse pad with my Contour mouse. It felt okay, too… for about the first four hours. By the end of the first day in my new profession, the outside of my right-hand pinkie was hurting. After the first week, it was killing me, and I had no idea why; this very same model of mouse had served me well for two and a half rigorous years at my previous employment. After testing and flunking various chair arm changes and silly collections of foam pads, I decided to try and replicate my last known working situation by getting a smooth, polished board the size of a mouse pad to simulate a proper desktop. Surprisingly, this only helped a little. Feeling that I had no choice, I packed the Contour mouse away and tried other ergonomic pointing devices – various standard ergo mice, a Kensington Orbit trackball (nice trackball, by the way), and finally an Evoluent Vertical Mouse. This last stop was reasonably comfortable, but I missed my Contour Perfit mouse, and wondered why things had suddenly gone so wrong between us. Like the end of a whodunit, the identity of the culprit hit me one day out of the blue. On the bottom of a Contour Mouse, there are five smooth feet. If any dirt, hair, or other nastiness gets on these feet, the mouse resistance will imperceptibly increase, causing greater tension in the mousing hand, greater stress, and finally pain. Now the feet on my mouse were clean, but they were something else as well – scratched. I mentioned before that this mouse was heavily used. As it turns out, those feet don’t last forever – they wear out, and when they do, they become like brake shoes. No wonder my hand hurt! When they heard my sad story, the wonderful folks at Contour Design happily sent me a complimentary set of replacement foot pads, which, combined with my smooth mouse board, restored the Contour mouse to its rightful place as my primary pointing device. In summary: If your hand hurts while using a Contour mouse, check the surface you are using and the condition of the pads. Before the Perfit mouse, I was using a plain old rounded optical mouse with one of those horrible wrist pads. My fingers were cold and stiff at the end of the day. Had I continued in that arrangement, I probably would have been on the road to serious RSI and compromised productivity. So for me, the Contour mouse was a lifesaver and continues to be so every day I work. However, I have a brother who suffers from a type of RSI and has about the same size hands as mine. When I let him try my Perfit mouse, he found it an extremely painful experience and couldn’t see how I stand it. Every man (and woman) has a different size, shape, and mentality, so it stands to reason that what works for one will not necessarily work for all. But if you’re like me, the Contour mouse may be exactly what you need. Disclosure: This review was made with my own personal, duly purchased Contour mouse.